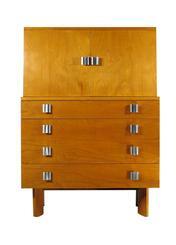 Birchwood veneer chest on chest with two doors over four drawers. High polish aluminum wavey pulls. Upper interior configuration shown in catalog photo. 48" x 34" x 20"
Very Good Condition. Retailed thru John Stuart; metal tag & burn stamp inside drawer.